You can can create the energy to turn your dreams into reality, by knowing the secrets of What To Say When You Talk To Your Self. I choose my thoughts. No thought, at any time, can dwell in my mind without my permission. I have talents, skills and abilities—and I’m discovering new talents all the time. I take time to listen and communicate. I’m patient and understanding. It’s worth working at, and I do. I focus my attention on the things I can control. If I can’t affect it or direct it—I accept it. 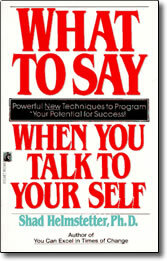 Acclaimed psychologist Dr. Shad Helmstetter shows you how to make positive Self-Talk a permanent habit. Give yourself the kind, loving, determined support you would give to your best friend. Harness the power of the ultimate motivator—you!